The American Association of Veterinary Parasitologists 63rd Annual Meeting will be held July 14-17, 2018 at the Curtis Hotel, Denver, Colorado, USA. We very much enjoyed this venue for our conference a few years back and look forward to returning. 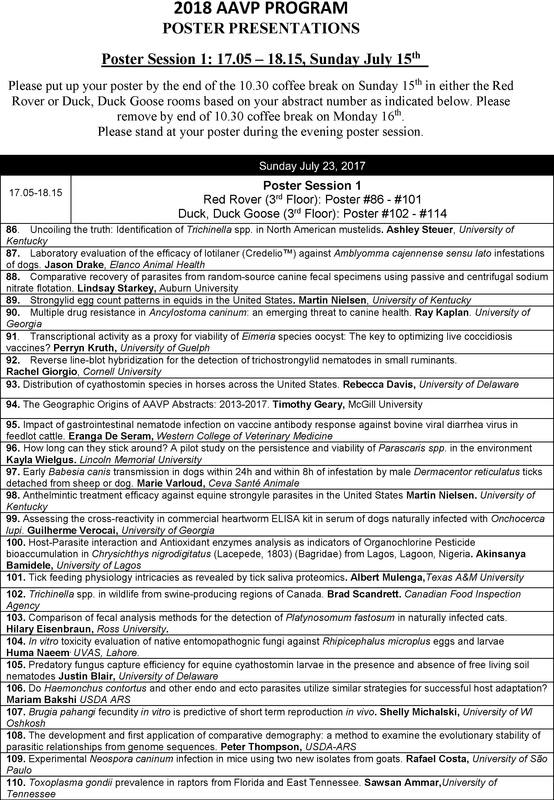 The American Association of Veterinary Parasitologists (AAVP) will hold its 63rd Annual Meeting on July 14th - 17th in Denver, Colorado. This meeting has never been more relevant and promises to deliver a varied, exciting program bringing together scientists from academia, industry, government as well as private practitioners. It will provide a discussion forum for many of the new scientific and technological developments being applied to tackle current issues in veterinary parasitology including parasiticide resistance, climate change and vector-borne diseases as well as the changing regulatory environment and the launch of new parasite control products. The 2018 Program Chair, Dr John Gilleard, and the Program Committee, Drs Tim Geary, Mason Reichard, Doug Carithers, Jessica Rodriguez, Ashely Steuer and Al Marchiondo are currently assembling an outstanding scientific program. The theme of this year’s meeting is “Collaborating to Solve Complex Challenges”. 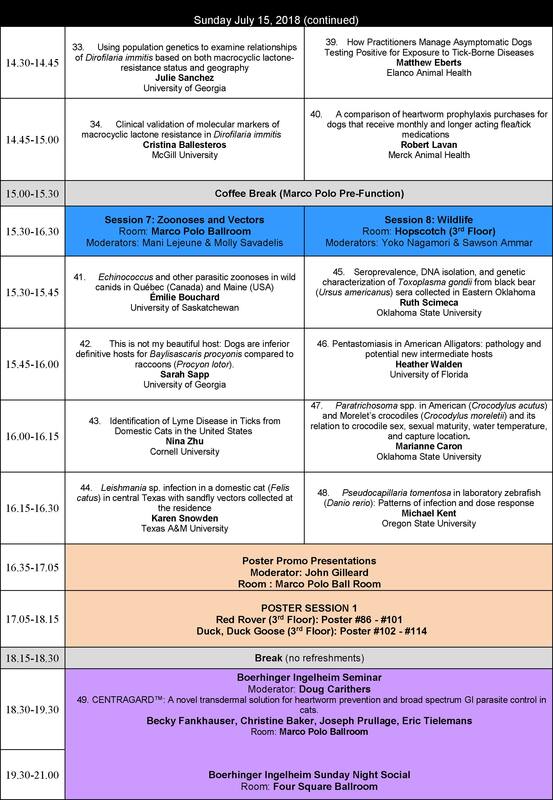 The plenary talks on Saturday will provide state-of-the-art examples of how to study parasite community complexity and investigate the impact of co-infections with presentations by Dr. Lisa Mansfield from Michigan State University and Dr. Vanessa Ezenwa from the University of Georgia. The President’s symposium on Monday will cover recent exciting progress in the development of vaccines for veterinary parasites with a focus on gastro-intestinal nematodes and coccidia. The invited speakers for the President’s Symposium are Professor Edwin Claerebout from the University of Ghent, Belgium, and Professor Damer Blake from the Royal Veterinary College, London, UK. As has been the long practice of the AAVP, the 63rd Annual Meeting will include student presentations and a student competition. We will again integrate all student papers into the topical session that is most appropriate. While this presents some logistical challenges for the competition and the judging, it reinforces our philosophy that the student’s research should be presented along that of other members. 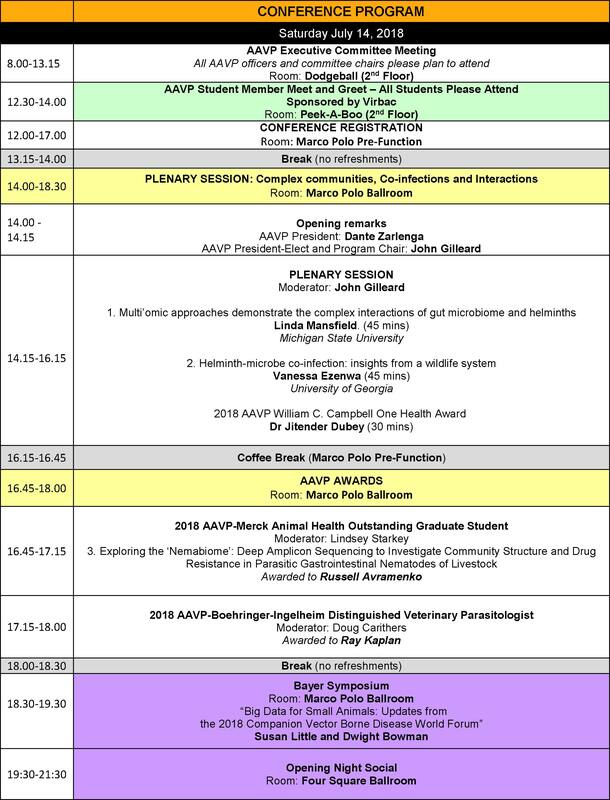 The program will also include presentations by recipients of the AAVP-Boehringer Ingelheim Distinguished Veterinary Parasitologist Award, and the AAVP-Merck Outstanding Graduate Student Award. 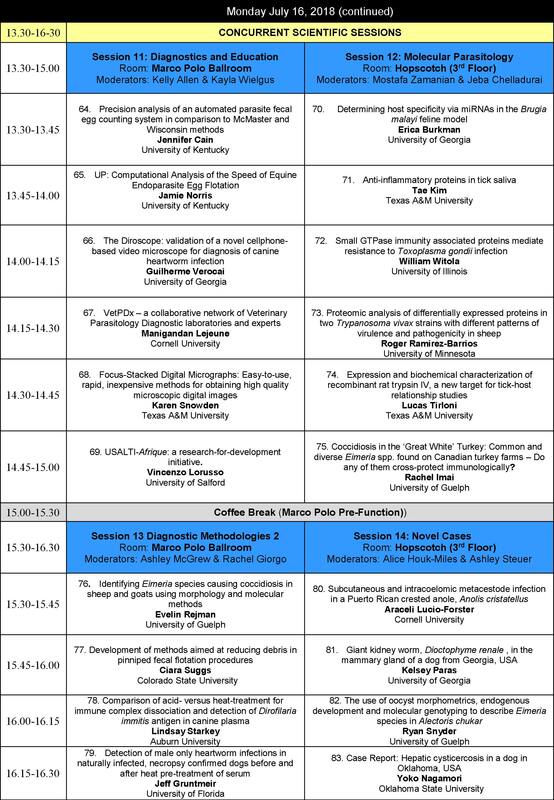 For the first time this year, the poster sessions will start with a 15 minute session in which each poster presenter will have the opportunity to give a “1 slide / 1 minute” pitch describing their poster. 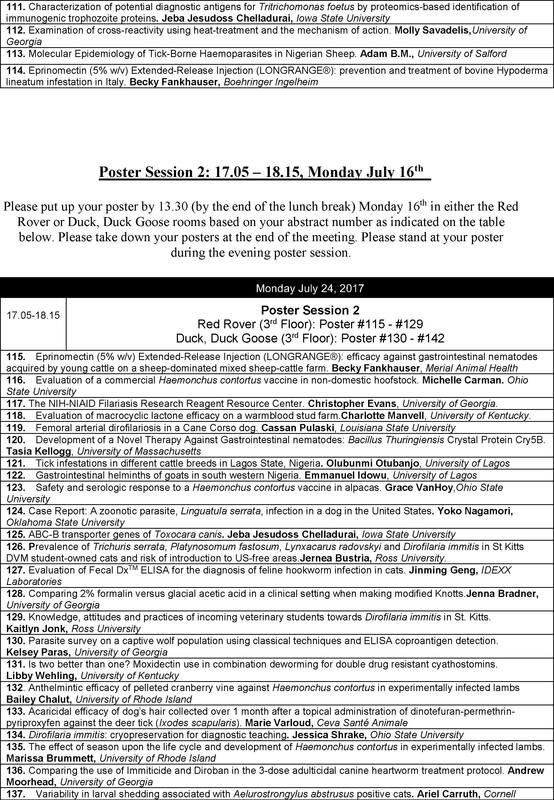 This is a fun and effective way for poster presenters to highlight their key message(s) and encourage delegates to visit their poster. More details will follow. +Meeting Locatio+n69+ue to space constraints, this trip will have an enrollment cap that is yet to be determined. Final trip details and enrollment instructions will be emailed after the deadline for abstract submissions. For any details about this trip please contact Dr. Jessica Rodriguez (jessica.rodriguez@zoetis.com), or Dr. Ashley Steuer (ashley.steuer@uky.edu). Sunday morning will begin with an early breakfast for current and new members of the many AAVP committees to review the past year’s progress, entertain new proposals, and prepare committee reports to be presented to the AAVP membership at the business meeting on Monday. As a reminder, the committee chairs are: Archives: Tom McTier; Awards: Lindsay Starkey, Constitution and Bylaws: Joe Camp; Education: Antoinette Marsh; Finance: Andy Moorhead; History: Sue Howell; Newsletter: Frank Hurtig; Program: John Gilleard; Electronic Media: Meriam Saleh; Publications/Outreach/Research: Miguel Suderman, and Nominating: Sheila Mitchell. Of note, data in the AAVP List Serv, managed many years by Bert Stromberg, has been rolled into the current AAVP contact list and is no longer functional. Socials will be held each evening sponsored by Bayer on Saturday night, Boehringer Ingelheim on Sunday night, and Elanco on Monday night. Updates to the program, as it continues to develop, can be found at the this web site (https://www.aavp.org/) which has been revamped this year thanks to amazing efforts of the Electronic Media Committee led by Dr. Meriam Saleh. Please note that the final program for the conference will be posted on the AAVP web site, and in the Summer Issue of the Newsletter. The Program Committee now invites abstracts for oral presentations with a submission deadline of April 16th 2018. The meeting of the AAVP is a very successful vehicle for the dissemination of the latest data and views on the biology and control of parasites of veterinary importance. It is also an excellent networking opportunity. We sincerely hope that you will consider presenting a paper or simply joining us in Denver this summer. It is highly recommended you pre-register for the Denver meeting. Final acceptance of abstracts will be dependent on having received a completed registration by May 29, 2018. You can register online by clicking here. On-line payments can be completed by credit card (Visa, MasterCard or American Express). The American Association of Veterinary Parasitologists 63rd Annual Meeting will be held July 14-17, 2018 at the Curtis in Denver, Colorado, USA, 1405 Curtis Street Denver, Colorado 80202, USA telephone: 303.571.0300 (Contact number only. Do not use this number to make reservations). Contemporary design meets good old-fashioned fun at this unique hotel in?downtown Denver. Discover a vast array?of arts, entertainment, and sports ?venues near Curtis Denver – a? DoubleTree by Hilton Hotel. Be ?welcomed with a warm chocolate chip?cookie on arrival. Play a game of rock-?paper-scissors, and then browse our? Denver hotel’s library. The Five & Dime?store brims with treats from the past. Each guest floor is designed to reflect a pop theme from TV to music to art or sports and beyond. With a stay at The Curtis Denver – a DoubleTree by Hilton Hotel, you'll be centrally located in Denver, steps from Denver Center for the Performing Arts and Buell Theatre. This four-star hotel is within close proximity of 16th Street Mall and Colorado Convention Center. Complimentary WiFi access is available in all guest rooms and meeting rooms. This property allows pets in specific rooms only (surcharges apply and can be found on the hotel website in the Fees section). Guests can request one of these rooms by contacting the property directly, using the contact information on the booking confirmation. Discounted overnight self-parking is available at $25.00/vehicle/night (valet parking is $40.00/vehicle/night). Please note that The Curtis does not have its own airport shuttle. The Curtis – a DoubleTree by Hilton is a 100% smoke-free environment. Smoking indoors and/or burning any type of candle or incense is strictly prohibited and will result in a fine of $250.00 per incident. Book online where you'll be able to book and hold your reservation with a credit card – click here. Or, you can call Hannah Harrison, the special events Reservations Coordinator, directly at: 720-889-4782, be sure to mention our Group Code: AV1, with the Group Name: American Association of Veterinary Parasitologists. Conference rooms have been set aside and the hotel has offered a special room rate of $199.00 for Single or double occupancy. This includes complimentary regular speed WiFi access within guest rooms. Children under 18 years of age may stay for free in their parents' room. It is important for all meeting attendees to stay at this hotel in order to satisfy our room block commitment. Make your room reservations by June 12th, 2018. After that date, the unreserved room block will be released, and the special conference reduced rate will expire. Note: should you choose to arrive at the Hotel earlier and/or depart later than the conference dates, you may be subject to non-contract room rates before and/or after the conference. Making these types of reservations cannot be done electronically. You must phone Hannah (option 2 above) and make reservations for your entire stay. Students looking for room share should contact Jessica Rodriguez (jessica.rodriguez@zoetis.com), Ashley Steuer (ashley.steuer@uky.edu), or post on the Student Chapters of the AAVP Facebook page. Early Bird” hotel special room rate is available until June 12th, 2018. Of note: Book early, “Early Bird” rates are based upon availability only. A finite number of rooms have been contracted at that rate and are likely to be taken before the June 12th deadline. 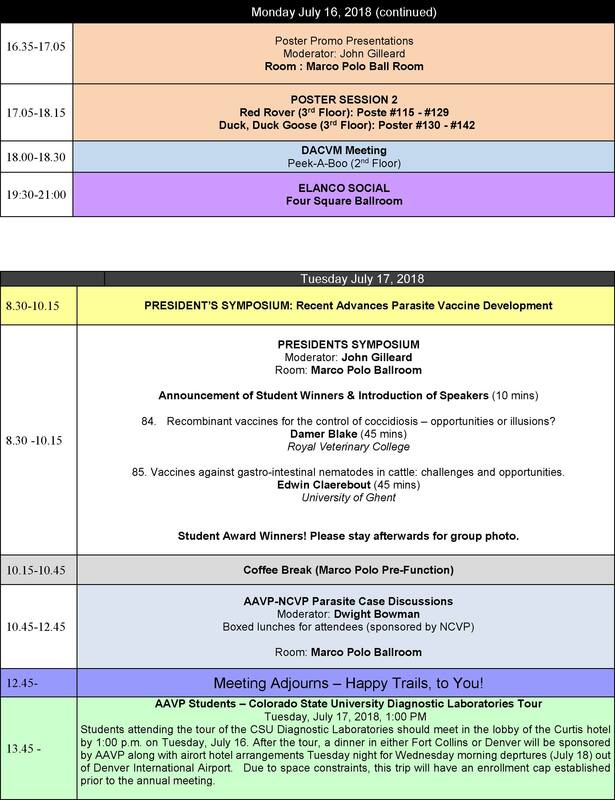 The 2018 program continues with many of the previous approaches which we believe will enhance an already fun and informative veterinary parasitology meeting. Attendees beware: given there are no less than 150 paid registrants, it is a physical impossibility to accommodate the temperature wishes of each. This has been and continues to be a key complaint in the annual reviews of the meeting. Last year there were nearly as many complaints for “too cold” as there were for “too warm.” To enjoy the event, the smart play is to “layer up” and bring outerwear that can be easily removed. 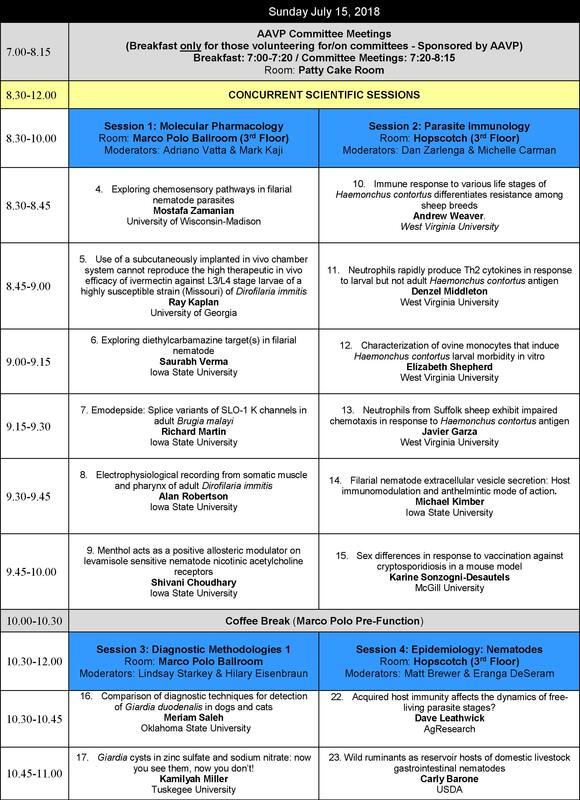 The full program is displayed below or you can click here to download a PDF version. All oral presentations will be given a 15-minute time slot. Plan to deliver your presentation in 12-13 minutes to allow time for questions. Please remember to summarize and repeat questions before responding so that the audience can clearly hear and understand. Audience microphones will not be available this year so repeating the question is imperative. Monitors will not be on the podiums this year. A speaker ready room will not be available. Use good judgement in the selection of colors, fonts and image size. If you must preface a slide with “...You probably can’t see this...” or “...This may be hard to see ...” then it should not be in your presentation. Expect that room lights will be on at least midway in the meeting room. A “green...yellow...red” light system will be placed on each podium to provide speakers with notices of the time remaining for their talk. When the light turns red, the microphone and slides will be turned off. Seems cruel, but it has been a remarkable asset to keeping the sessions on time. Electronic presentations on commonly-used portable media (memory stick/USB, JumpDrive, CD) must be used. AAVP will provide equipment in each meeting room for projected computer presentations; personal laptops are not to be used. Files must be placed in the appropriate computer desktop folder and in the designated session prior to the start of your session. An audiovisual technician will be onsite to help with this. Sufficient time (30 minutes) is provided between sessions that include successive papers to accomplish this task. Please plan to load and, if time permits, quickly view your presentation during this time. You will not be permitted to load your talk when you reach the podium to present. PowerPoint is the only software supported for electronic presentations. Other programs or the use of personal computers are at the discretion of the Program Chair. Slides (2 X 2) and overhead projectors will not be available. We will be using the same “CATALYST” system for abstract submission as last year. Enter your E-mail address and password, then click "Sign In". Click "Save", on the bottom right of your screen as necessary. (*) If required fields are missing data, you will see the missing data tabs indicated with a red triangle. Click "Submit" on the bottom right of your screen when you are ready to submit your abstract. You will immediately receive a confirmation E-mail that your submission was successful. If unsuccessful, click "Support" at the top of the site (or "Site Support" for sign in issues) to submit a "support ticket". All emails come from "noreply@omnipress.com". To ensure you receive all communication, please be sure "omnipress.com" is added as a safe sender or have your IT department whitelist "omnipress.com". If you have any technical issues, please click on "Site Support," at the bottom of the login page. For additional help, please use this helpful guide. Enter your E-mail address, password and confirm password. Click the "Sign Up" button. CATALYST will be send you a "Confirm Your Account" E-mail. Click on the turquoise button in your E-mail labeled, "Confirm Account". Click on the "Please click here to login." Click "Save" on the bottom right of your screen as necessary. (*) If required fields are missing data, you will see the missing data tabs indicated with a red triangle. You will immediately receive a confirmation email that your submission was successful. If unsuccessful, click "Support" at the top of the site (or "Site Support" for sign in issues) to submit a "support ticket". If you have any technical issues, please click on "Site Support", at the bottom of the login page. As in previous years, the word limit for abstract text (excluding author names and addresses) is 300. Abstracts may not contain tables. Abstracts should not be hypothetical in nature and should contain reference to real data. The submission portal allows you to submit an abstract and make changes until 11:00 PM on April 16, so no need to wait until the last second to upload your abstract! You will likely find it easiest to compose your abstract in a Word file then, once finalized, transfer (cut-and-paste) the title and abstract to the appropriate text boxes. Presenters will be notified before the early registration deadline (May 29) whether their abstracts have been accepted. If you have any questions regarding program, please do not hesitate to contact the Program Chair, John Gilleard at jsgillea@ucalgary.ca or 1-403-210-6327. Likewise for technical issues regarding abstract submission contact "Support", on the top right of the screen within the abstract submission web site, for assistance. Please remember, final acceptance of your abstract is contingent upon confirmation of receipt of the registration fee by May 29. If you wish to apply for a Young Investigator Travel Grant, the required forms are posted here and are also available when you enter your abstract information. Final submission of your abstract will take place after you have uploaded the required forms on the abstract submission web site. If you have any questions, please contact Jessica Rodriguez (jessica.rodriguez@zoetis.com) or Ashley Steuer (ashley.steuer@uky.edu). Abstract submissions open February 19, and closes April 16, 2018. Registration deadline for authors May 29, 2018. Information on the AAVP achievement awards can be found in the Spring 2018 AAVP Newsletter. Awards include the AAVP-Boehringer Ingelheim Distinguished Veterinary Parasitologist Award, the AAVP Distinguished Service Award, the AAVP-Merck Outstanding Graduate Student Award, and the AAVP-CAPC Graduate Student Award in Zoonotic Disease. Click here to download AAVP Awards: Guidelines for Application and Nomination. The awards are given to undergraduate/graduate students who compete successfully in the Student Presentation competition. The Oral presentations award three places, and the Poster presentations award two places. 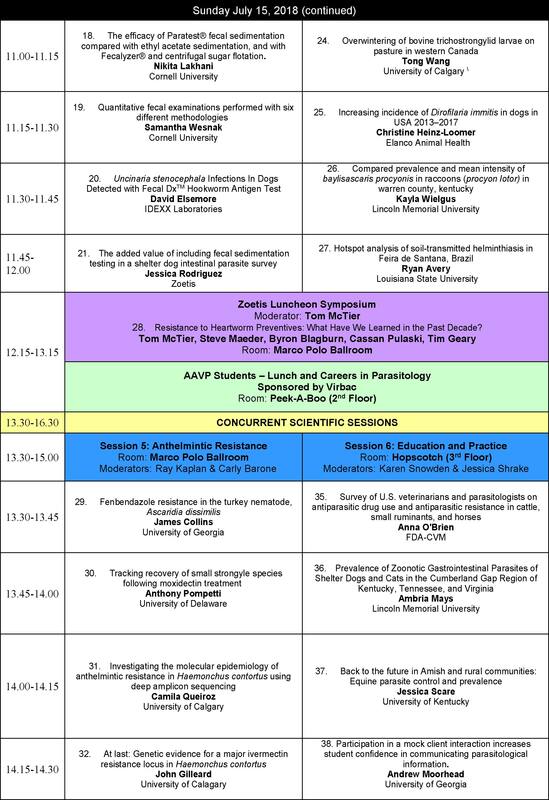 All students who submit applications for the AAVP Young Investigator Travel Grants should indicate on the Annual Meeting web site if they wish to be part of the Best Student Presentation competition. Students who do not apply for a Young Investigator Travel Grant but wish to compete for the Best Student Presentation Awards should do likewise. Judges at the meeting will use the checklist available below to help rate the presentations. The Awards Committee will offer two awards to students that present their own research. In 2018, the first, second and third place awards will be cash prizes sponsored by Bayer Animal Health and first and second place poster awards will be cash prizes sponsored by Elanco. Click here to download to Poster Award Judging Checklist. Click here to download to Oral Award Judging Checklist. The travel grants are competitive grants awarded to full-time DVM or undergraduate/graduate students enrolled in an accredited institution of higher learning and pursuing studies in veterinary parasitology. Deserving individuals who are within three years of their degree are also eligible for this award. Students must be an AAVP member in good standing as of the abstract submission deadline. Application for a Travel Grant and submission of an acceptable abstract, are needed for this award. Students applying for the travel grant are also eligible to compete for the Student Presentation Awards. However, the student who receives the AAVP-Merck Outstanding Graduate Student Award will receive reimbursement of travel expenses and therefore will not receive a Young Investigator Travel Grant. Click here to download YITG Application Form. Feb 19: Conference website opens for submission of abstracts. April 16: Deadline for submission of abstracts. May 29: Deadline for payment of Early Bird Registration fee. 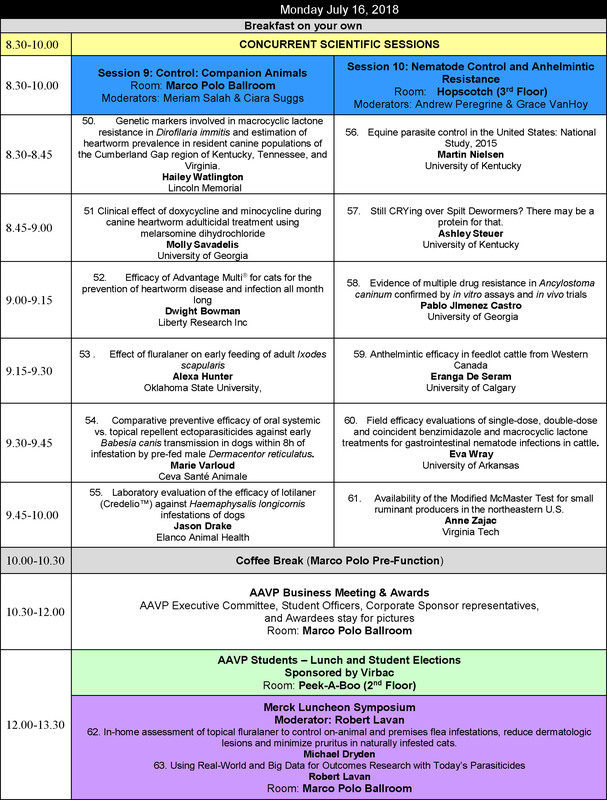 June 16: Conference program posted on AAVP website and June Newsletter. June 12: Deadline for payment of Early Bird hotel room rate at the Curtis Hotel. July 14 – 17: Conference in Denver.